I am very lucky to be sitting in a delightful, if somewhat expensive, bistro in King’s Lynn, overlooking the Great Ouse, rather than clapped up in the Tower of London. I spent several hours today trespassing through the Sandringham estate. I didn’t set out to tr espass of course, but I am not sure how I could have avoided it. I left my B & B at Hunstanton, this time after a decent sized breakfast, around 8.45. The morning couldn’t have been lovelier. The sky was a clear blue and there was no wind at all. I walked down to the front and admired the Wash. Sunny Hunny was certainly living up to its name. High tide had just passed and the water was still lapping up to the sea wall. 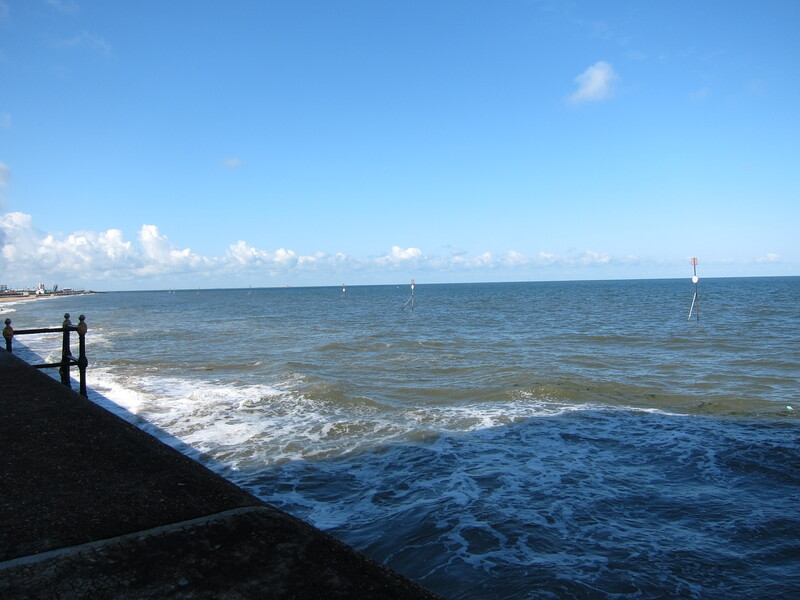 Yesterday’s wind meant the sea was still fairly choppy. Far to the north I could still see the enormous wind farm that was very noticeable from Holme- next-the-sea. The promenade continues for several miles and although it is hard underfoot, makes for fairly brisk progress. Eventually, the prom comes to an end and the nearest public foot path runs inland along the top of a bank, with a field to the seaward side and marsh inland. I continued along this for some time, kicking myself for having forgotten to bring my hat. I am very prone to sunstroke and the sun was blazing down relentlessly. I slapped Factor 50 all over myself but feared a bout of headache and nausea. In due course I arrived at the delightfully named Snettisham Scalp: a little outpost on the coast, of the village of Snettisham. Even more pleasing was a cafe and beach shop where I was able to buy a straw hat for the princely sum of £1.99. I sat and had a coffee and relaxed for half an hour before heading onto the shore again. It is relatively easy to walk along the beach here, some shingle, but also hard packed sand. The tide had gone out a long way by this point and I lived in hope of finding King John’s Crown Jewels, lost in the Wash in 1216. Sadly, no sign of them, but I will keep my eyes peeled tomorrow. There are huge numbers of seabirds of all sorts, and also, sadly, lots of jellyfish exposed to the beating sun. Signs warned walkers about walking too close to plover nests. I did not see any although I am sure I wouldn’t recognise them anyway. But I did see a lot of oystercatchers. The whole area seems to be managed by the RSPB. On the inland side is a lagoon, with a steep bank between the lagoon and the beach along which is the foot path. The map showed that at the south end of the lagoon, all of the tracks converge to cross a canal where there is a sewerage outflow but the lie of the land and the direction of tracks has changed since my map was published, mainly, I suppose, because of last December’s storm surge. In consequence I found myself on the wrong side of a barbed wire fence and gate, and had to exercise some ingenuity to get back onto the right track.. After some wriggling around, I reached a gate near the crossing point. My map showed a series of paths apparently running along the tops of banks between marsh and fields, so I turned south along a bank near the sewage works. A track was running to the side, but I stayed high. I turned back towards the sea, but after about half a mile I came to a gate. I went through but the track was so over grown, I couldn’t continue. I decided to return to the point where the track split and take the track. Turning round, I saw a sign on the gate saying “Sandringham Estate, no public access.” However, I had no choice. I couldn’t continue as the path was so overgrown, and it would have been foolish to walk into the marsh. I did refrain from taking photos on the Estate. I had not fancied the track earlier, because of the sound of gunshot, but it was that or all the way back to Snettisham and round by the road. I didn’t think it was shooting season, being only the 30th June, but I not really up in these things. There was a van parked, with some dead duck under it, but no sign of life. As I walked along the track, I heard more gunfire but I didn’t see anyone. I walked on and on, following the tracks, never seeing the sea, but sure it was there some half mile west of me. The Sandringham estate is clearly run for wildlife and shooting. There were many, many butterflies and other insects, and frequent sightings of pheasant and grouse. A couple of hours brought me to a point where I could turn inland to follow a road and various other paths into King’s Lynn, which would have totalled at least four miles extra, or continue through the estate. Emboldened by the fact that I hadn’t seen a soul, I decided to press on, turning down a metalled road which did say ”Crown Estate: Private Road”, but not very noticeably, and anyway, there are lots of private roads that can be walked down, I argued to myself. I checked the map and saw that the track led, eventually, to a little hamlet called South Outmarsh, where I could pick up the track next to the Great Ouse into kings Lynn. I decided to risk it. As I walked along a large farm vehicle went past – I held my breath lest the driver stop and challenge me, but he sailed on by. I carried on, then tuned left, in the same direction as the vehicle. Unfortunately, he hadn’t gone far but was in a yard, cleaning the vehicle. I effected an air of nonchalance as I walked through the yard. “Excuse me, can I help you?,” a young man in mirrored shades, combat trousers and a tattoo overcoat asked me. “Oh?” I didn’t actually lie or say I didn’t know, merely fumbled with my map and said that I was trying to get to South Oumarsh. I smiled and took my sun glasses off. He recoiled, horrified by the windswept , red eyed apparition in front of him. His immediate thought was how to get rid of me as soon as possible. I pointed to the shed where we were standing, and to the village. I smiled again. “Thank you SO much. I’ll be as quick as I can.” I scurried off, wondering what I would have done if I had been forced to go back. I expect I could have cried. However, that was unnecessary as he was very kind and polite and II was very glad not to have to make a detour of several miles. Once over the sluice I stopped to have a celebratory piece of chocolate. Unfortunately, it had melted in the most disgusting fashion all over the inside of the rucksack. In the way of chocolate it promptly ran amok all over my face, hands and trousers. I must have looked a terrible sight. I eventually reached the track beside the Ouse, visualising bars and boats and already savouring a crisp white wine. I was sadly disappointed. The stench of the dead and rotting fish was so appalling I almost gagged. No self- respecting wine bar would go anywhere near it. 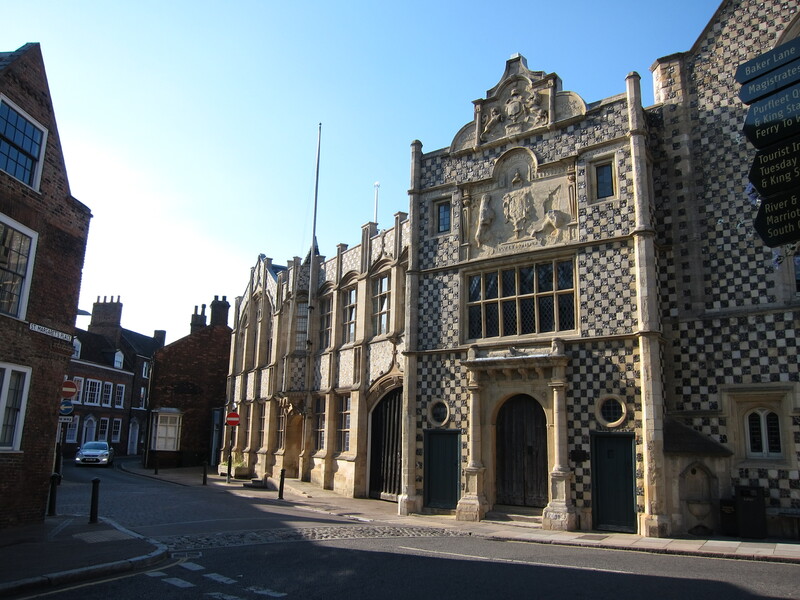 The walk into King’s Lynn was a trudge, and I was very disappointed, initially, with the town which looked dirty and grim. I arrived at my pub at around 4.45 – the oldest continuously inhabited pub in King’s Lynn. When I reached the heart of the town, I could see it was absolutely delightful – the huge Minster dedicated to St Margaret of Antioch, Mary Magdalene and All the Virgin Saints dominates the square flanked by Georgian facades with the mediaeval houses of the Hanseatic League behind. It is absolutely gorgeous – a real gem of a traditional English provincial town. Down by the staithe, I finally found the bistro and bar with the glass of white wine I had been fantasising about. See review. A modest 28 km today – 17.5 miles. I am glad to say the painful knee has resolved into a lightly pulled muscle rather than any joint problem. It is a nuisance and mildly painful, but can be walked through in about fifteen minutes and is not beyond the reach of paracetamol. This entry was posted in Norfolk and tagged King's Lynn, Snettisham. Bookmark the permalink. This is one of the trickier coastal walks isn’t it? I ended up following the beach from Hunstanton to Snettisham Scalp and carried along south into the RSPB Reserve (this was before the storm surges this winter though). Then followed a track to a place marked as “The Decoy” on the map where there is then a dead-end bridleway marked on the map. I saw some other people cycling this path and asked them if it led to the Dersingham and they confirmed it did and had used it to get to the RSPB reserve. There wern’t any private signs and I assume it would be OK since it led to a long bridleway which was otherwise a dead end. I stuck to the track all the way to Dersingham. In Dersingham I went through the centre then on paths over Dersingham Common and into the Sandringham Estate. I followed the “Scenic Drive” though the estate (which although no footpaths are marked is accessible to the public and maps on the Sandringham Estate show the paths that can be used). I then crossed the minor road and followed the track south east to the road junction (east of Brickkiln Covert and west of Woodcock Wood). THen picked up the minor road heading south west (part of national cycle route 1, hence the red 1 on the map) to the A149 and followed a cycle path next to the road to Babingley then turned left to follow a bridleway into Castle Rising. This is a lovely village, with a castle, which I visited. Then onwards along the footpath west over the woodland south of Wootton Carr and into North Wotton. Then followed the old route of cycle path 1 to the A1078. At the industrial estate I continued south along the cycle path until the end of the industrial estate then turned right on roads leading to the A1078. I then followed the road through the industrial estate heading for North Lynn Farm. Then followed the footpath along Old West Sea Bank (which is not properly signed, overgrown and in poor condition). I then followed the byway on the east side of the River Great Ouse into Kings Lynn. Like you my first impressions wern’t good, but I soon found the lovely old part of the town and found it rather charming in the end. I split the walk in two over two days at Dersingham though, the distance was too far for me in one day. I think you probably chose a better route! I like the sound of Castle Rising – I’ll have to make another visit. How far round are you?